Working at a construction site can be risky and dangerous. There are many elements or materials that may pose hazards and may affect the safety and health condition of construction workers. It is even more dangerous when they are exposed to extreme weather conditions such as heavy rain. This is why it is important for them to take the necessary precautions to reduce the risks of injuries and health-related problems in the workplace. Construction workers normally work at dangerous heights and use heavy and perilous equipment and machinery, making them susceptible to injuries and certain diseases. 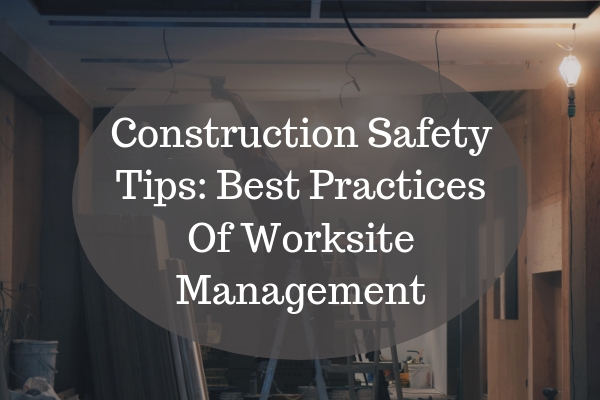 To maintain a safe, healthy and hazard-free workplace, here are some safety tips in the construction site. Always wear appropriate safety gear to avoid construction site hazards. Make sure you are properly trained before you start a new job or use any equipment you haven’t used before. Before you use scaffolding and ladders, inspect them first to avoid falls. Lift items properly, especially heavy ones, to prevent back strain. You can use a back brace to protect your back and feel more comfortable when lifting construction items. When working around flammable materials, follow fire safety precautions and wear appropriate work clothes and gear. Avoid working in extreme weather conditions like when it’s too windy or icy as this may cause danger such as electrocution. Use safety materials for construction such as safety vest, chains, and harness, safety gloves, glasses, and goggles as well as safety masks. If there are great hazards or unsafe conditions in the workplace, report it immediately to your supervisor so they can be prevented or fixed before they can cause any damage to the construction workers. Always keep in mind these safety tips for work and make sure to follow safety tips for construction all the time. It is not enough that you know the basic safety rules for construction. It is also important that you understand and you can follow job site safety rules in rain. Construction is a tough and dangerous job so you have to protect yourself, especially in vulnerable working conditions. For your utmost safety, here are some construction worker safety tips in rain. Reduce exposure to the elements. When it is raining and the wind is strong, it is best for construction workers to work outside in a shorter duration. Large projects can be broken down to smaller tasks to increase efficiency and help limit the workers’ exposure to the elements. Utilize a Warm Break Area. Despite the cold weather, working outdoors is inevitable in construction work. However, it is important to have a warm break area where you can rest and keep yourselves warm. It can be a tent with heaters or you can also use heated trailers. Make sure to handle heating devices properly and safely. Drink water instead of coffee. Working in cold weather will tempt you to have a cup of coffee to keep yourself warm. However, it is not ideal for you as coffee has caffeine, which can increase your heart rate. Instead of coffee, drink more water to keep yourself hydrated and energized. Keep track of weather forecasts. It is important to keep yourself updated on the weather forecasts so you can prepare yourself for the working conditions that you will face. If there’s a typhoon, it’s best to stop the work for a while until the weather gets better. Prepare and inspect work vehicles. Before using vehicles, inspect them thoroughly and see if they are functioning well. It is important to promote not only the safety in construction site but also road safety. Wear proper gear for severe weather. If it’s raining and you have to work, make sure to wear appropriate clothes for the weather such as heavy coats, boots, and hats to ensure construction gear safety. Check work sites daily. While you follow construction site safety rules and regulations, it is also important to check your work sites regularly to assess its condition and the possible hazards that may occur during work. Use waterproof tarps to cover construction equipment and supplies. This is one of the most important construction tips that you have to observe as it can help secure all your construction materials from the rain. Only use high-quality tarps and make sure they are durable and efficient. Scaffolding can be a really dangerous job or task so you have to be very careful when doing this. Use electrical power testing equipment to protect the workers from possible deadly shocks.